Economical and lightweight, these stainless steel freezer racks hold two-inch cardboard and plastic cryo-boxes. Unlike the typical freezer rack that must be fully removed to access all the boxes, these sliding try racks can remain in the freezer and only the tray that is needed can be slid out. Both drawer and tray freezer racks require the freezer to be located where the door to the freezer can be fully opened in order to completely access all the freezer boxes stored on each tier of the rack. There is ample space on the front of the sliding tray freezer rack to place a descriptive label to identify what each rack contains. 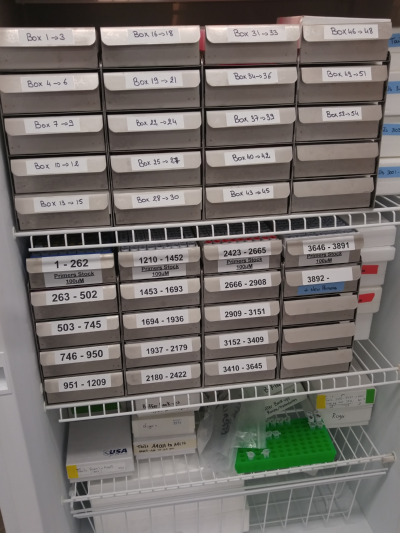 This image is an excellent example of how one customer used these sliding tray freezer racks to organize several thousand lab samples.